Education and Grid electricity can’t be taken for granted when you happen to live in one of the most sparsely populated countries on the planet. If you live in the rural part of any country ‘public services’ like education has a habit of passing you by; but in Botswana – with its half-a-million square kilometers of rural land – most of the country is ‘off grid’. 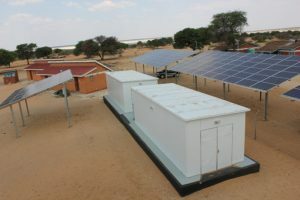 The Government is making one of its biggest investments to make sure children don’t miss out on a modern education…The Ministry of Education and Skills has embarked on an ambitious project to provide 20 rural schools with state of the art off-grid Solar Power plants – each providing an impressive 90 to 150kVA. That’s enough for the School’s pupils, office block, kitchen and up to 10 associated ‘staff houses’. A micro-grid. 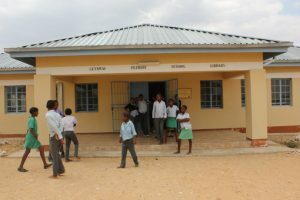 The government recognizes the importance of education and seeks to offer an equal opportunity to all Botswanan children -regardless of whether they grow up in the city – or remotely. No electricity means no computers – and without learning computer skills a child becomes part of a lost generation …unable to reach his/her full potential. For that reason the Government have signed off this initiative which represents one of their biggest, newest investments. 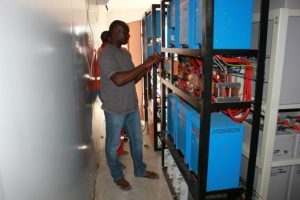 A long way from the cities, sophistication of these electronic installations is an unfamiliar sight – but no short-cuts have been made in guaranteeing the future of electricity provision, with state of the art power plants which may comprise of up to 12 Inverters 48V Quattro 10kVA; and BlueSolar 150/70 MPPTs. There’s no shortage of sun, of course, to fire-up the BlueSolar PV Panels in arrays of up to 47kWp which harvest the power into OPzV Batteries banks as large as 288kWh. 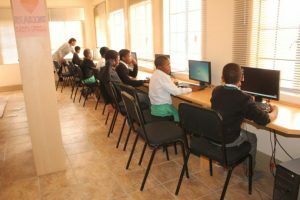 Now the very latest technology is available to these children as an educational tool. No matter that their school is far out of town, increasingly rural children can enjoy the same advantages as children in the cities.By taking a long-term view the power needs of remote schools, villages – even towns – can be met through installing Solar Powered Micro-Grids. The power used by these far-sighted schemes is cleaner; uses less infrastructure; is more easily maintained; and is more secure from acts of god …or civil unrest. Not only that, they have their costs under control …and the price they pay for their power, over the lifetime of the installation is a fraction of the price paid by those of us who are grid-connected. Think about this: In the UK the average annual bill for electricity today is £600. The average annual electricity price-rise is 8%. In 25 years time (the lifetime of a solar panel) the average annual bill for electricity will be £4,100. 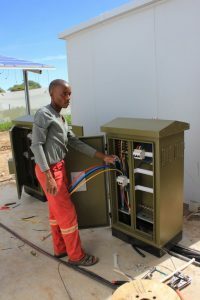 The economic argument for generating your own electricity from Solar Power has been won – it’s cheaper.In many ways – the Botswanan Government, and Botswanan schoolchildren are showing us the way ahead.